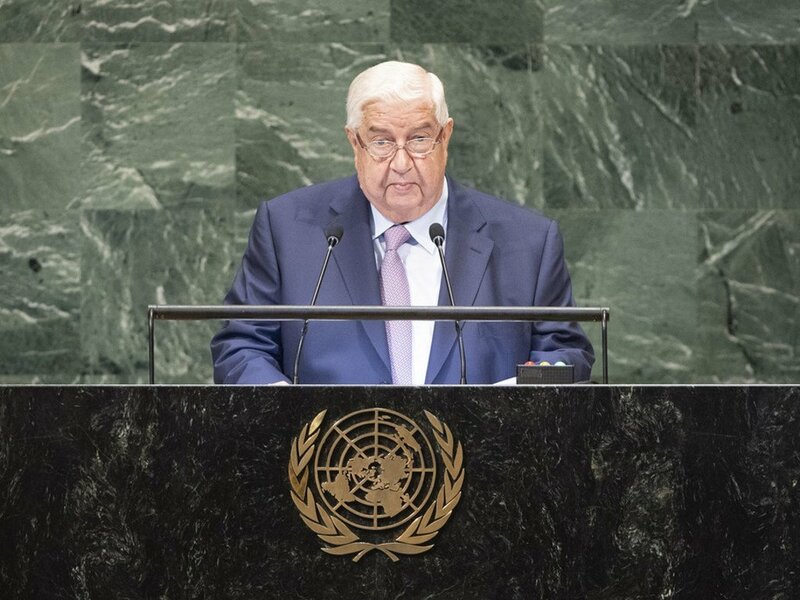 Walid al Muallem, Deputy Prime Minister and Minister for Foreign Affairs and Expatriates of the Syrian Arab Republic addresses the seventy-third session of the United Nations General Assembly. “To the disappointment of some, here we are today, more than seven years into this dirty war against my country, announcing to the world that the situation on the ground has become more secure and stable and that our war on terror is almost over, thanks to the heroism, resolve, and unity of the people and the army, and to the support of our allies and friends,” he told the Assembly on the fifth day of its annual general debate. “The coalition destroyed the Syrian city of Raqqa completely; it destroyed infrastructure and public services in the areas it targeted; it committed massacres against civilians, including children and women, which amount to war crimes under international law. The coalition has also provided direct military support to terrorists, on multiple occasions, as they fought against the Syrian army. “It should have been more aptly named 'The Coalition to Support Terrorists and War Crimes',” he declared holding up Russia, as an example of legitimate international cooperation. Mr. Moualem also denounced Turkey for supporting terrorism and committing direct aggression against towns in northern Syria in violation of the country’s sovereignty, unity, and territorial integrity as well as of international law. “Since day one of the war on Syria, the Turkish regime has trained and armed terrorists, turning Turkey into a hub and a corridor for terrorists on their way to Syria,” he said. While he stressed that Syria had eliminated all its chemical weapons, he accused the rebels of using them to falsely incriminate the Government and provoke “wanton aggression” launched by the US, France, and the United Kingdom in April in response. With the situation becoming ever more stable, Mr. Moualem invited the millions of refugees who have fled their homeland over the past seven years to return. 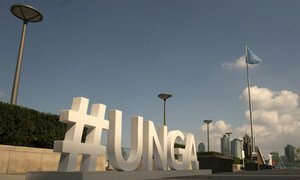 “All conditions are now present for the voluntary return of Syrian refugees to the country they had to leave because of terrorism and the unilateral economic measures that targeted their daily lives and their livelihoods,” he declared. “The return of every Syrian refugee is a priority for the Syrian State. Doors are open for all Syrians abroad to return voluntarily and safely,’ he said, adding that thanks to Russian help his Government will spare no effort to meet the basic needs of the returnees.